Sony Pictures Imageworks (SPI) provided a range of effects for the Kingsman: The Golden Circle, including the robots in the film. The new film is the sequel to Kingsman: The Secret Service (2014), and is based on the comic book series Kingsman, created by Dave Gibbons and Mark Millar. The film features Julianne Moore as the evil Poppy, a drug lord and Americana Killer Robot fanatic, along with the return of many of the cast from the original film such as Colin Firth and Taron Egerton. Mark Breakspear, was SPI Visual effects supervisor on the project. At The Golden Circle premiered in London on 18 September 2017, Claudia Schiffer was joined at the premiere by a lifesize version of the Beautybot she voiced in the film. At Poppy's secret hideout there is a specialist beauty parlour operated by a robot "beautybot" based on Claudia Schiffer. The German supermodel has been on more than one thousand magazine covers and since 2002, she has been married to the Kingsman's director Matthew Vaughn. "Claudia had a huge say in the look and design of that process, which you can only imagine was great", commented Mark Breakspear SPI Supervisor. "She wanted it (beautybot) to look like her from her heyday and that was fine, ... and she was a 100% right on the notes she was giving us on the details of her chin and making sure it looked just like her, ...and that took a long time, she even came to us with colour references of how she wanted things to be". When SPI bid the project the Beautybot in the script was a fully talking and animating robot. "Then Matthew (the director) said he did not want that" explains Breakspear. "It took a while to understand what he wanted, but the Beautybot moves from beautiful pose to beautiful pose - that you would find in a library of Claudia Schiffer's catwalk career, and while she is a killer, her inner workings were hidden behind an ipod-ese shiney plastic plate". For ironic comical value, the Director did not want the evil intent of the character reflected in her beautiful polished appearance. The director felt that even having the character speak would be too much. The killer beautician, was initially not going to have any lines, but Breakspear and the team felt that when the newly recruited assassin first entered the salon, some dialogue was required, and Schiffer agreed to provide the recorded dialogue. Given the Beautybot originally had no dialogue, her design had a fixed unchanging facial mask. Her poses and body silhouette are therefore critical to her performance. The lines of action and key poses of the Beautybot are framed on the modeling language and style of Claudia Schiffer. In fact, Schiffer was directly involved in the approval process of the Beautybot animation. The design around the time of film on set, had the bot only humanoid from the waist up, below that was a chair like wheel arrangement. As this was used for the blocking and framing on set, it was decided that the new, more humanoid Beautybot would also be on wheels. "Imagine: half office chair, half terminator" jokes Breakspear. "But as the stand-in person on set had been moving around, sort of on wheels when shooting the plates. When we decided to change the design, to a full body robot, we put Beautybot on rollerskates". SPI built their own animation library of 'Claudia Schiffer' robot poses from the animators studying a huge library of clips from the real model's life. "We imagined that the robot was just running through this library of positions in her database, and she has to go to whatever is the most appropriate pose from the last pose - completely robotically. If you watch her she does this very stylised posing, .. even when she is torturing someone with a tattoo gun, when she puts the gun back, she does it with this nice twee pose with her body". The Bot proved so successful that additional shots were added in the film. For example, the end compound sequence, with Beautybot's grenade launcher attack at Harry Hart (Colin Firth) and Eggsy (Taron Egerton), was never in the original Script. The filmed version has three henchmen raining an attack down on our heros. "Originally, these three guys run out, pull pins on grenades and toss them, and then there was the whole umbrella gag" explains Breakspear. "Not long before the deadline of the film, they said this should be Beautybot - not these three guys". These actors were removed in post and the Beautybot added in their place. "Thank god for our team in India, the original bad guys were taking up 3/4 of the frame, but thanks to a whole lot of work, with roto, camera projection from other plates into this plate in NUKE, we rebuilt the entire background and then we could add Beautybot walking in with a grenade launcher". When she meets her fiery end and is blown up, the team at SPI removed Colin Firth's umbrella and replaced it with a digital version so parts of the Beautybot could bounce off and fall around the Kingsmen. "Matthew (the director) was very excited by that shot, and I can only imagine it was an awkward breakfast in the Vaughn house, when he showed his wife some of the dailies, "Oh and this is how I killed you yesterday", jokes Breakspear. Inside all good animation teams, there is a discussion of backstory and motivation. SPI's team when looking at the clearly absurd world of Poppy came up with their own elaborate backstory to inform their animation decisions. Breakspear recalls discussions where they imagined that perhaps there had been "somewhere in the background of this Jungle lair, there had been a set of scientists who's day to day job was to build robots. They started with the robot arms and then the Robot Dogs, - since that tech looks similar. But then maybe they were fired (or were killed) and so they hired some new guy from Apple and he came in and designed the Beautybot, and this is the process that led to where we are today. I think it really helps to imagine the backstory in our brains so when we are working there is logic behind it". While the inner workings of the Beautybot that are unseen do not exist, all of the gears and robotic parts that are seen in the neck, arms and mid torso are fully non-intersecting, volume preserving in design, such that if such a bot were to be built, it could work. Which is exactly what happened. Recently Mark Breakspear has been 3D printing various camera rigs and specialist vfx tools. He has his own Prusa MK 2S 3D printer. 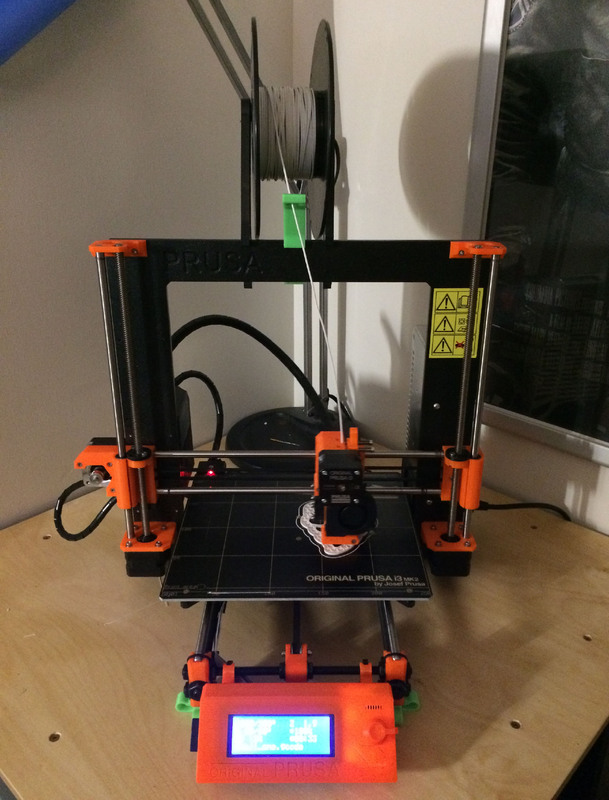 "I budgeted for a different model, but I did a lot of tests and I have to say, for the budget, the Prusa is the best printer on the market in my opinion", he comments. "A 3D printer is my new 'go-to' supervisor tool when I am shooting" he adds. "I often go to set and people ask, how are we going to mount this and I pop up, saying- 'I have printed one of those!'. I think it is the new key supervisor tool and I think every supervisor should have one". Breakspear runs his Prusa in combination with Fusion 360 software, "it is an engineering tool, but it is so easy to get into and make vfx useful things" he adds. This use of 3D printers by supervisors is appearing more widely amongst VFX supervisors and it is a somewhat ironic shift back to a very practical era of special effects, amongst the most digitally literal of VFX specialists. "At home, I have bought a CNC machine and I am going to be buying a laser cutter, - there are all sorts of things I want to be able to make for work and be able to film such as rigs, especially camera rigs,..it just allows me this to film more things (for VFX)", explains Breakspear. For the film's premiere the production did a full 3D print of the Beautybot, to pose and use as a promotional prop, in the film the robot is only ever CGI. The large scale 3D professional printing for the life sized Beautybot was done directly from the SPI files. "The production knew I did 3D printing and they asked if I could print a full sized Beautybot, not knowing that that would be take me about 200 years on the printer I personally have !" he laughingly recalls. In reality it was built by a professional fabricator based on sectioned off parts from SPI. The Beautybot at SPI had 500 separate parts. 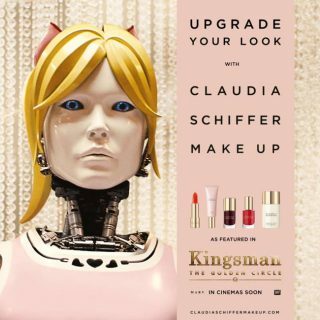 As part of the marketing of the film, the makeup products seen in the beauty parlor behind the Beautybot are actually being marketed through the Claudia Schiffer Make Up line. "In the background of the beautician's spa, - where she (Beautybot) does all this torture to people - are these Claudia Schiffer line of beauty products. Her products are in the background all the way through and on display in the movie", Breakspear comments. In addition to the Beautybot and the dogs, SPI provided a cybernetic arm of Charlie Hesketh (Edward Holcroft), a former Kingsman trainee who lost his arm in the previous film. SPI worked on the second arm sequence, that is featured after Charlie is upgraded. Both the Arm and two dogs, Bennie and Jet, were highly accurate in non-intersecting, logically plausible modeling and animation. "You could literally 3D print them, and while they obviously wouldnt work as robots, all the shapes and volumes would work" says Breakspear. The Dogs are highly complex in terms of modeling and rigging but the dog design had been worked on by a concept artist before SPI joined the project, so the Dogs came together from a design point of view very quickly. The greatest challenge for SPI centred around if it was "a robot dog, or a dog robot? We of course looked at all the Boston Dynamics real robots, and we ended up with something that is 51% dog vs robot, in other words if you watch them they do things that are very 'dog' like, as opposed to robots that happened to be in the shape of robots". This can be seen, for example, in the way the animators have Bennie and Jet knock people over, which is modelled on how hyenas chase down prey and knock their legs out from under them, and is instinctually canine in motivation and action. SPI was also careful to not go too far in making the robotic dogs become 'Disney dogs' that no longer felt like killer robots. SPI also made the entire jungle around Poppy’s diner hideout, which was actually shot at Warner Bros. Longcross Studios outside London. The entire jungle was fully digital and done with the new Sprout tool developed at SPI. The film has a stylistic device of matched dissolves including one that matched a move in on Eggsy friends bag of Marijuana. This track in on the bag matched dissolved to a jungle shot descending on Poppy's secret hideout. The first half was filmed using a Borescope.SPI did some other sequences such as the destruction of the Kingsman mansion. For the Kingsman jungle and this transition into Poppy's world, the SPI team used their new Sprout tool extensively. Breakspear was really impressed with both its output and the ease of use. "In the hands of a director or an art department supervisor, they could just paint where they want everything. You could give them a brush and they can paint not just one tree but thousands of trees in one stroke." 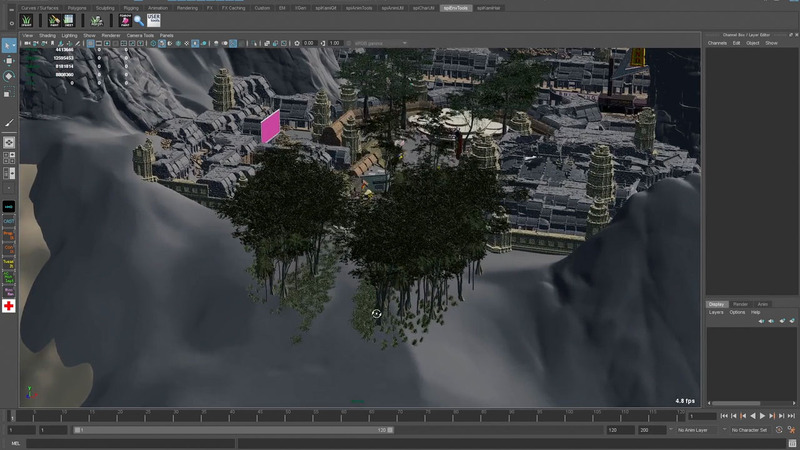 The system allows not only allows for individual items, but also through instancing and advanced database variation it can paint multiple non-repeating types of environments. For example "if you set up a little enviroment with a fallen tree, perhaps with some moss on it and some other trees around it,.. then you can copy that to the brush and paint variations of that concept and you can paint that in massive strokes to cover can entire valley very quickly", explains Breakspear. "It is very powerful and yet incredibly simple to use, so when we did the Jungle it came together very quickly".